will undoubtedly share great stories, insight and hilarity. Despite what Cherry has said a few times about him during Coach's Corner, Ron MacLean is no dummy. To help him write this book he enlisted the help of Kirstie McLellan Day - the best selling hockey author in the past few years. She has previously penned the blockbuster autobiographies of Theoren Fleury and Bob Probert. 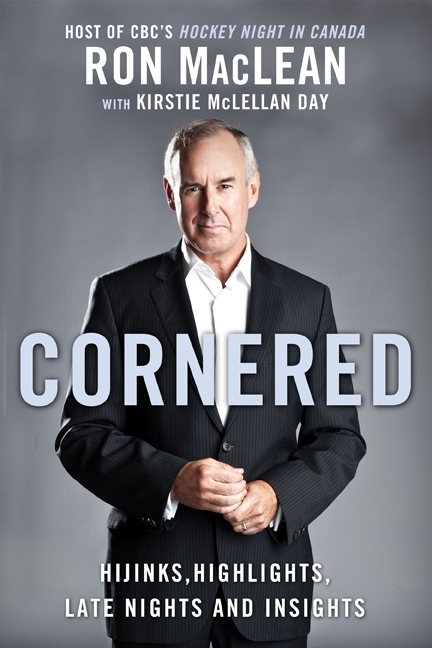 The best part of this book will be how much of the real Ron MacLean is revealed. Not the on-camera persona but rather the human side, including his interests outside of hockey, the family man, and his insecurities and weaknesses. McLellan Day was the perfect choice as presenter. Of course, MacLean has no shortage of great stories, most funny and, in typical Maclean style, punny. A great many of these feature Don Cherry and the real behind the scene battles behind his battles with the CBC and others. It was quite interesting learning how much he back "Grapes" off camera, threatening to walk out in solidarity on more than one occasion. MacLean also talks about his relationship with NHL commissioner Gary Bettman, commenting on their awkward and infamous annual Stanley Cup interviews. And of course MacLean uses the book, like his television air time, as a podium to air his own beliefs in hockey. 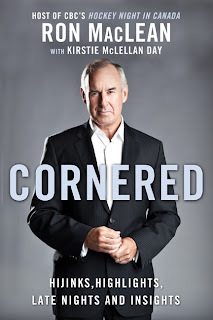 All in all, Ron MacLean's autobiography Cornered is a wonderful read a kid who dreamed big and improbably accomplished it. He is both a hockey legend and very much the guy next door.